GUNS N' ROSES appears to be teasing a celebration of the thirtieth anniversary of its iconic debut album, "Appetite For Destruction", by placing ads around New York City featuring the record's artwork with the hashtag #APPETITE30TH. "Appetite" will officially turn thirty this Friday (July 21), and the band is scheduled to perform an intimate show one day earlier at New York City's famed Apollo Theater. Among the "Appetite" anniversary ads popping up around town is a particularly notable one in Times Square, which longtime GN'R associate Del James took a picture of and posted on his Instagram account. An anniversary poster has also surfaced right outside the Apollo, which has previously partnered with SiriusXM for similar concerts with Paul McCartney in 2010, Bruce Springsteen in 2012, METALLICA in 2013 and James Taylor in 2015. GN'R's invitation-only performance for SiriusXM subscribers will air live nationwide on SiriusXM's Guns N' Roses Radio and Howard Stern's Howard 101 channel. Guns N' Roses Radio launched on Thursday, July 13 and will air through Saturday, July 22. Former GUNS drummer Steven Adler told the "Trunk Nation" show earlier this year that Fernando Lebeis, who is part of GN'R's management team, had "some good ideas" for the thirtieth-anniversary celebration of "Appetite For Destruction". Adler appeared with GUNS onstage last November in Buenos Aires, Argentina, as well as on three separate occasions during the U.S. leg of the "Not In This Lifetime" tour last summer. It was rumored in September that former GUNS N' ROSES guitarist Izzy Stradlin turned down a five-figure fee to play with the band at their April 2016 reunion shows. Stradlin tweeted about the dispute, writing that the group didn't want to "split the loot equally." 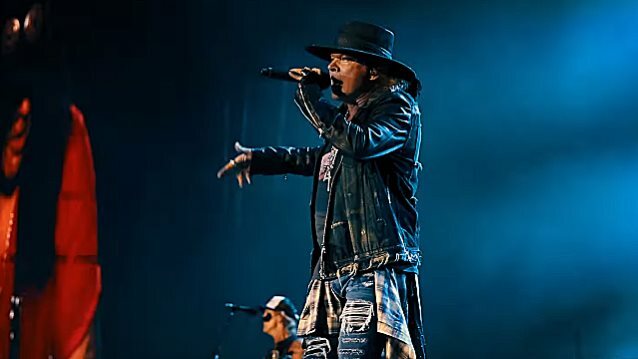 GUNS N' ROSES' "Not In This Lifetime" tour features three members of the classic GUNS N' ROSES lineup — guitarist Slash, bassist Duff McKagan and singer Axl Rose — backed by drummer Frank Ferrer, guitarist Richard Fortus, and keyboardists Dizzy Reed and Melissa Reese.